Lisselan Golf Club is an overachieving little western County Cork golf course, near the town of Clonakilty. The nine holes (with 18 sets of tees for a full round) plays over beautiful hillside and through the historic 19th-century Lisselan Estate. More than just a very cheap play (just €20-€30 for 18), the parkland layout at Lisselan has some fine little holes. The par-3 fifth/12th plunges sharply downhill from the tee to a small green overlooking the countryside. No. 8/17 is beautiful, challenging and unique, a fantastic par 5 that doglegs through tight pines to a peninsula green. You take a raft across a river to get to that green. Small funiculars running between some holes is another novel Lisselan touch. 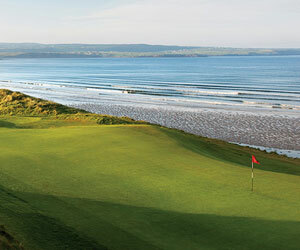 Even nearby Ballybunion can't offer that. A tiny funicular transports golfers between the third green and fourth tee at Lisselan. No. 2 at Lisselan Golf Club. Lisselan Golf Club outside Clonakilty, County Cork. The par 3 fifth plays steeply downhill and offers countryside views. The clubhouse at Lisselan Golf Club. No. 8, the course's best-known hole, tees off over a small bridge. A tiny shelter offers a respite from the challenging eighth. Stately Lisselan House overlooks the eighth green. A raft transports golfers from the eighth fairway to green. The par-3 first plays only 128 yards but the green is well-guarded.